Detective White was mortally wounded by a teenage escapee from the State Industrial School. On the afternoon of October 15, the 54-year-old victim and two other officers were investigating a report of a residential burglary. Inside the home, they encountered the suspect armed with a .32-caliber carbine. 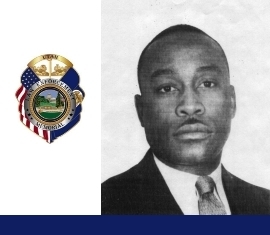 When Detective White called for the suspect’s surrender, he was shot in the abdomen. After a brief standoff, the suspect surrendered. Detective White died three days later. The suspect was charged as an adult. Pleading guilty to first-degree murder, he was sentenced to life in prison. Paroled in 1976, he was shot by police during an armed robbery the following year. Permanently paralyzed, he died eight years later in a convalescent home. Detective White was married and the father of seven children. He is buried in Ogden City Cemetery. His bronze name plaque is sponsored by the Ogden Police Benevolent Association. I remember the day he was shot. My father was one of the officers there. It occurred 3 housres to the South of our own home. I was skipping home from kindergarten when I saw my dad, gun drawn under a tree. I remember him telling me to go home and tell mom to lock all the doors and don’t let anyone in u til he called. It could easily have been my father. Det. White went in the south door near the kitchen while my dad came up from the basement where he would join Det. White. The perpetrator was lying in wait. He stated his goal that day was to kill a “pig” (police officer). Det. White peeked around the wall and was shot. My father just a few feet behind coming up the stairs. That disgusting teen deserved so much worse than he got in my eyes. My father respected and admired Det. White. His funeral was my first for a fallen Hero. My admiration and respect for Det. White,has never waivered. He was an excellent Det.& Father. Not because I knew him, but because my Father did, and in turn he taught me how much he deserved to be honored and respected. It still breaks my heart all these years later. The Utah Peace Officer Association is going to be honoring Detective Marshall White at the Fallen Officer Trail Ride in Moab on April 18 2015. We would like to invite Family and friends to come to the event to help Honor Detective White and all our Fallen Officers. Was DETECTIVE MUELLER one of the officers there that day? They were partners.